If Boston was the first Adventist Forum chapter to organize, New York was not far behind, so this year also marks the 50th anniversary of the Metro New York Chapter and a celebration is being held September 8, 2018. Initially, the key movers were Rick Meyer and Gail Kendall who had been involved in the moves towards founding the Boston Forum before they moved to New York as students at Columbia Law School. They brought the new concept of a forum chapter with them and shared it with other students and graduates that they met at the New York Center, an Adventist evangelistic outpost in Manhattan. Encouraged by their new friends, Rick and Gail launched what they initially called the New York Forum in the Fall of 1968. Meetings were held on some Sabbath afternoons in Earl Hall, the Religious Center at Columbia University. Towards the end of the forum chapter’s first academic year Rick was asked by an Earl Hall official why their group was the only Christian group on campus not using St. Paul’s Chapel, a magnificent Romanesque structure with a famous five-manual Aeolian-Skinner organ. This suggestion came at a pertinent time, for Adventist authorities had recently put the New York Center on the market, having decided that it was a failure as an evangelistic center. Rick responded by forming what was originally named the Adventist Community at Columbia, which, beginning in September 1969, sponsored weekly Sabbath morning worship services in the Chapel. The Community was associated with the Forum chapter, which continued its quarterly meetings on Sabbath afternoons. The Sabbath morning meetings were designed in typical Adventist style with two segments: the first was a Sabbath School-styled study of a biblical book that the group had agreed upon, held in the crypt of the chapel; after that, for the second segment, attendees went upstairs to the sanctuary for their worship service. 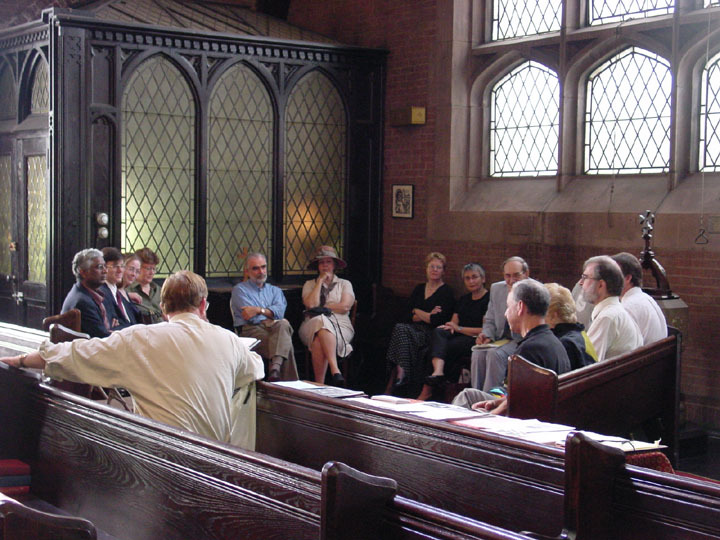 In this way the NY Forum became unique, the only chapter whose primary focus was weekly Sabbath worship and to use a university chapel. The Chapel and its organ helped draw Adventist graduate students from New York City’s music conservatories also. These included Lonietta Thompson Cornwall, whose playing of the Aeolian-Skinner organ in the chapel was a highlight for many attendees. For others it was the high quality speakers that led out in discussions of significant issues. The administrators of St. Paul’s Chapel took an interest in the group as one of the most faithful and well-attended student groups. Each semester they would provide a list of new Columbia students who had put their religion down as ‘SDA.’ Thus, a younger generation of students started joining the group. Since the Community was meeting weekly, some suggested that it become an official church. The Greater New York Conference showed no interest in it as a church or branch Sabbath School. Flailing around for a solution, the group turned to Neal Wilson, then the Vice-President of the General Conference for North America who visited the Community for a Sabbath, and engaged in a long discussion with the members. He eventually urged the Community to remain independent as a group but friendly toward the church, representing it unofficially on campus. In retrospect, this was the best possible result, for it gave the Community complete freedom to do what it felt it needed to do, and the acknowledged friendly relationship with the church opened the way for it to invite Adventist scholars and other speakers of interest to speak at its services. It was about this time that two unexpected personal issues emerged that troubled the community. Disputes over racism and homosexuality split the congregation and some of the key founding members left, raising the question of the viability of the community. But no. Others proved equally determined to support the community. Much to my surprise, I was elected president of what at that time was known as “The Triumvirate” or “The Governing Body.” We dropped the distinction between Community and Forum meetings and, because a majority of our membership was no longer made up of Columbia University personnel, we changed our official name to The Metro New York Adventist Forum. We worshipped at St. Paul’s Chapel for over 30 years, until the university upped the rent to $500 per week, a sum that was clearly beyond our ability to pay. Ed Samuel, our architect member, persuaded us that St. Mary’s Episcopal Church on W. 126 St. was the right choice for a new home, and it became our meeting place about 1999. While I lived in New York for 44 years, 40 of them as Forum President, my community was the Forum and my closest friends were there. I often mused in wonder about the quality of the people who were members over the years. The Forum community proved a huge blessing to me personally, and I thank all the members who helped provide that blessing over many years. Ronald Lawson’s PhD from the University of Queensland, Australia, is in both sociology and history. He taught at the City University of New York for 38 years. He now lives in Asheville, NC, where he initiated the formation of the Asheville Adventist Forum in 2016. He is making his many published articles on Adventism available on his website, www.RonaldLawson.net. Image courtesy of the Metro NY Adventist Forum website.